Bute Park at Bute Park and Arboretum ParkBute Park is an easily accessible 56 hectare (equivalent to 75 football pitches) green haven in the heart of the city. It is flanked by the River Taff, Sophia Gardens, Pontcanna Fields and Cardiff Castle. Filled with historic, horticultural and environmental features, it is internationally recognised for its grade 1 listed historic designed landscape, scheduled ancient monument, arboretum and a wealth of archaeological and nature conservation interest. The Arboretum, created in 1947 contains a mix of interesting and ornamental trees. Many of these are champion trees, the biggest examples of their species in the UK. A renowned herbaceous border runs alongside the Rive Taff. Our detailed plant guide can help you learn more about the flora in Cardiff's parks and gives you detailed information about what is at its best each month. Exploring Bute Park is extremely rewarding and once within the gates you will find it hard to believe you are so close to the bustling city centre. Bute Park also hosts a varied events programme throughout the year. Blackfriars Friary - An unusual layout of medieval Friary remains, excavated in the late 19th century by the third marquess of Bute and interpreted in Victorian brick to show the original building plan. One of only two full friary layouts to be seen in Wales, this feature will be significantly restored and interpreted as part of the ongoing improvement works to the park during 2012. 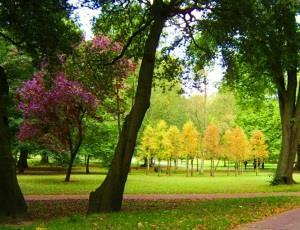 Bute Park Arboretum - created in 1947 contains a mix of interesting and ornamental trees. Many of these are champion trees, the biggest examples of their species in the UK. Animal Wall - Completed Oct 2010, the iconic William Burges landmark was cleaned and conserved for the delight of residents and visitors. Herbaceous border - A renowned herbaceous border runs alongside the Rive Taff. Our detailed plant guide can help you learn more about the flora in Cardiff's parks and gives detailed information about what is at its best each month. West Lodge - The restoration and extension of this former entrance lodge will provide a visitor information/orientation point, refreshment and retail facilities, as well as additional public toilets within the park during 2012. Mill Leat - the line of the former medieval millstream and mill pond, running below the walls of Cardiff Castle will be re'flooded during 2012 to restore beautiful views of the castle and enhance the character of a ‘forgotten corner' of the park. Dockfeeder - the slow flowing waters of the feeder canal bely its function as a supply of water to Cardiff's Docks. The feeder is a haven for wildlife and provides a contrast to the more formal areas of parkland. Despite their ancient appearance, the stones recall Cardiff's hosting of the National Eisteddfod in 1978. Sculpture trail - A series of timber sculptures , created from tree trunks in the arboretum provide interest throughout the park. Bute Park is open 365 days a year from 7.30 am – 30 minutes before sunset. If you are using a mobile device, the postcode for the park is CF10 3DX, but please note this is for guidance only as the park covers a large area. Pay and display car parking facilities are available nearby in Sophia Gardens (CF11 9LJ), Castle Mews (CF10 3ER) and North Road (CF10 3EA). Click here for further details about parking by Bute Park. Bute Park is very accessible by public transport. There are several bus stops situated along Castle Street to the south, and along North Road to the east. The West Gate entrance at the southern end of Bute Park is roughly 10 minutes walk from Cardiff Central station and 15 minutes walk from Cardiff Queen Street.